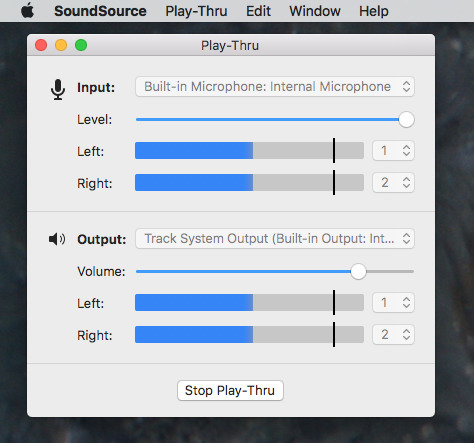 A pair of old OS X audio routing applications have regenerated, and have merged to form the new SoundSource 3.0.0 by Rogue Amoeba —and AppleInsider takes a look at the offering. It's not often that a brand-new app is released yet called version 3.0.0. SoundSource 3.0.0 from Rogue Amoeba hasn't been under secret test for two versions, though, this is a new app that replaces two old ones —one of the same name launched in 2003 and put out to pasture in 2012, and the long-ago deprecated LineIn that croaked in 2005. 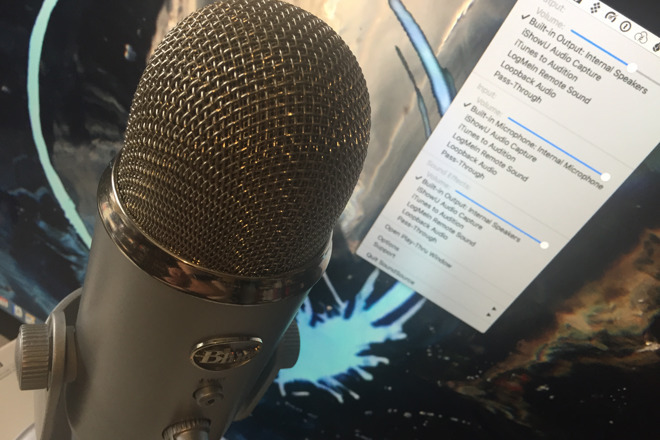 SoundSource puts an icon in your menubar so you can swiftly change audio settings, without resorting to Apple's settings menu or a buried utility to fiddle around. 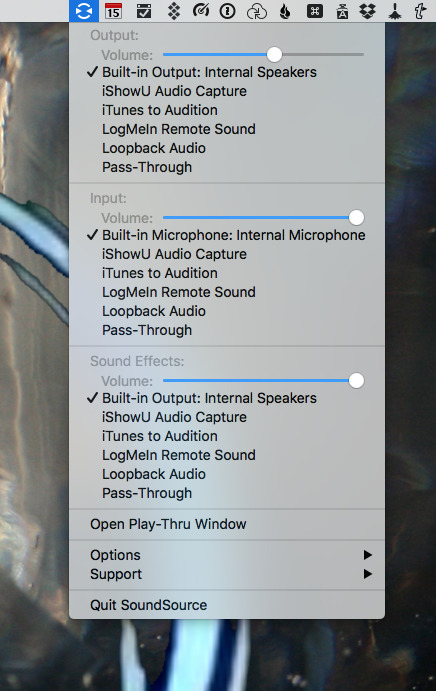 Switch from using your Mac's internal microphone to the better USB one you've just plugged in, on-the-fly. Change the volume on your internal or external speakers. Watch the sound levels on any input device so you can avoid distortions. This is all SoundSource does, and arguably you don't need any of it because you can accomplish every part through macOS Sierra's sound System Preferences. What's good about SoundSource, what's worth paying for, is its speed. If you're speaking and you can see your podcast app is not recording your voice, one click shows you that you're on the wrong mic. One more click and you've changed that. Audio routing problems in software can be frustrating, and fast solutions are a boon. Audio problems tend to also happen at the worst of times, like when you've got an interviewee for five minutes and you've just lost three of them because of a mic recording failure. So, just for the speed and convenience, SoundSource is a handy tool. We'd previously mentioned LineIn. LineIn's job was to take the audio from any input such as a microphone or an instrument and route it out to your Mac's own speakers or any external ones. What Rogue Amoeba has done with that lineage is revive the old SoundSource, add the old LineIn, and improve them both with the technology developed alongside the company's flagship Audio Hijack 3. SoundSource 3.0.0 is not an app that will radically change your life, but it will slip straight into your audio recording workflow —and it will make a difference. SoundSource 3.0.0 costs $10 direct from the maker's website where there's a free trial version too. What's more, if you're an existing user of any apps by Rogue Amoeba then you can get SoundSource for free.